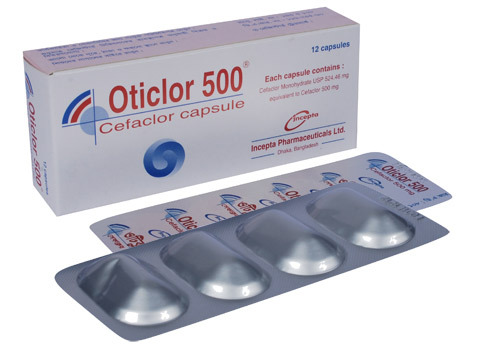 Oticlor 500 Capsule : Each capsule contains Cefaclor Monohydrate USP 524.46 mg equivalent to Cefaclor 500 mg.
Oticlor Dry suspension: After reconstitution, each 5 ml suspension contains Cefaclor Monohydrate USP 131.11 mg equivalent to Cefaclor 125 mg.
Oticlor Paediatric drops: After reconstitution, each ml drop contains Cefaclor Monohydrate USP 104.9 mg equivalent to Cefaclor 100 mg.
Aerobes, Gram-positive: Streptococcus pneumoniae, Streptococcus pyogenes (Group A beta-haemolytic streptococci) and Staphylococci. Aerobes, Gram-negative: Moraxella catarrhalis, Haemophilus influenzae, Escherichia coli, Proteus mirabilis, Klebsiella sp.,Citobacter diversus and Neisseria gonorrhoeae. Anaerobes: Propionibacteria acnes, Bacteroides sp. (excluding Bacteroides fragilis), Peptococci and Peptostreptococcus sp. 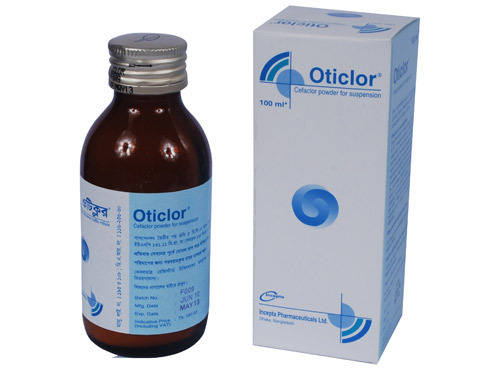 In more serious infections, such as otitis media, or those caused by less susceptible organisms, 40 mg/kg/day is recommended, with a maximum dosage of 1 gm/day. Safety and efficacy have not been established for use in infants aged less than 1 month. Adults: The usual adult dose is 250 mg every 8 hours. For bronchitis, the dosage is 250 mg administered 3 times daily. A dosage of 250 mg administered 3 times daily for 10 days is recommended for sinusitis. For more severe infections, such as pneumonia, or those caused by less susceptible organisms, dose may be doubled. Cefaclor may be administered safely in the presence of impaired renal function. Under such conditions, dosage is usually unchanged. Most adverse effects reported with Cefaclor are similar to those reported with other oral cephalosporins. The most frequent adverse effects reported include gastrointestinal effects (nausea, vomiting, diarrhea) headache and rash. Rarely, Serum sickness-like reactions consisting of erythema multiforme, urticaria accompanied by arthritis, arthralgia, irritability and fever have been reported. Cefaclor should be administered with caution in the presence of markedly impaired renal function. Dosage adjustments for patients with moderate or severe renal impairment are not usually required. Lactation: Small amount of Cefaclor have been detected in breast milk following administration of single 500 mg dose. 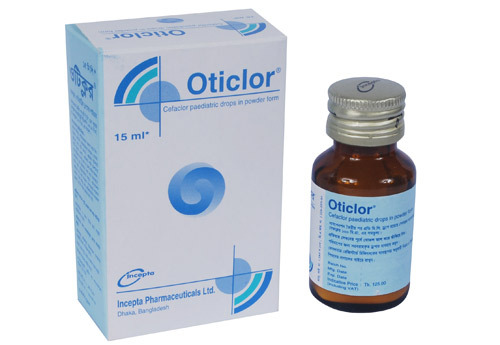 As the effect on nursing infants is not known, caution should be exercised when Cefaclor is administered to a nursing woman.